3G technology stands for third-generation technology , It is the wireless network technology which is utilized in the smart phones such as iPhones & Blackberries , While its predecessor , second-generation (2G) technology was formulated around voice applications ( like talking , call-waiting and voicemail ) . 3G Technology is the advanced wireless technology , It enhances the features that were available in second generation and adds further advanced features , It is widely used in mobile phones & data cards , 3G networks are faster than the previous networks , They offer increase in handset internet usage that help the businesses use social networking applications to advertise . 3G Internet Technology is used primarily in the smartphones & laptop PCs , It offers high speed Internet access to multimedia applications , 3G represents a step up from 2G which applies to only voice applications and it adds more versatility to mobile phones which allow the users to carry their life with them on the go . 3G technology puts a strong emphasis on Internet & multimedia services , such as web browsing , video conferencing & downloading music , Evolution of 3G technology was due to the limited capacity of 2G networks , 2G technology were built for voice calls & slow data transmission , But these services were unable to satisfy the requirements of present wireless revolution . 3G technology features can be divided into two categories which are the data rates & the security , The main feature of 3G technology is that it supports greater voice & data capacity and high data transmission at low-cost , 3G mobiles can operate on 2G and 3G technologies . The second feature is the security , 3G technology has greater security features than 2G like Network Access Security , Network Domain Security , User Domain Security & Application Security . 3G Technology presents localized services for accessing traffic & weather updates , Video calls and video conference is another main feature in 3G mobile technology , These features reduces the communication barriers between the people , that were not sacked even with mobile phones . The data transfer rates are high & can support live TV channels over phone , Online media is another exciting feature in 3G mobiles , 3G mobiles highly attract the music lovers as they can listen to the music & watch videos online and they can download huge files with a less time , Few 3G mobiles support MS-office & RSS feeds . All the functions performed in a normal 2G mobile device can be performed in 3G at a higher speed , 3G offers faster connectivity , faster internet access & music with improved quality , Overcrowding is relieved in existing systems with radio spectrum , The bandwidth , security and reliability are more . 3G technology offers the availability of fixed & variable rates , It supports the devices with backward compatibility with existing networks , always online devices , 3G technology uses IP connectivity which is packet based and rich multi media services are available . 3G technology offers greater bandwidth on the go , It allows mobile device users to access all of the Internet and multimedia applications that they usually access on the desktop PC connected to the home network . 3G bandwidth has much greater transmission capacity than 2G and although you lose some of the bandwidth if you are accessing your mobile device in a moving vehicle , It is still much faster than what 2G offers . 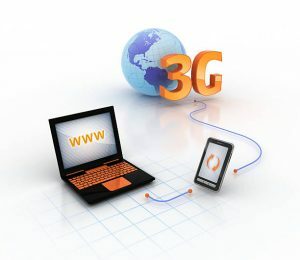 3G networks can utilize the packet-based Internet protocol connectivity , So , The mobile device will always be online & ready for Internet access , you will not actually pay for the connection until you start sending or receiving the data packets , such as sending an email or looking at a web-page . 3G mobile can be used as a modem for the computer that can access the internet , It can download the games & songs at high speed , 3G technology offers high quality voice calls & video calls , You can view live TV broadcasting in mobile , You can get weather updates and news headlines in mobiles . 3G networks increase the bit rate that helps the service providers to provide high speed internet facility and many applications to its customers , 3G devices can offer data transmission speed up to 2Mbits/s when used in the stationary mode . 3G networks provide you with multimedia services such as sharing of digital photos and movies , 3G technology offers the real time multi player gaming & location-based services , It allows the users to be online all the time and it also includes mobile office services , such as virtual banking & online selling and Teleconferencing at work is one of the best applications .